AMERICAN imperialism is attempting to whip up a frenzy of hate against the Democratic People’s Republic of Korea, which tested its first nuclear device on Monday. After over a decade of fruitless negotiations with successive US governments, who reneged on their promises and branded the DPRK part of the “axis of evil”, Democratic Korea has taken the inevitable step it warned would happen to defend its national security and independence. US President George W Bush, the biggest warmonger of the lot, claimed that the test poses a threat to global peace and security and denounced it as “unacceptable”. Bush said the action “deserves an immediate response” by the United Nation Security Council. He also said the transfer of nuclear weapons or material would constitute “a grave threat” to the United States, and the DPRK would be held “fully accountable for the consequences of such action”. Seismic reports suggest a test of a one kiloton atomic bomb, the equivalent of 1,000 tons of TNT and far smaller than the nuclear bombs the United States dropped on Japan in the Second World War. The underground test, in a remote part of the country under secure conditions, was successful and there were no radioactive emissions. But though the bomb was small the diplomatic fall-out has swept the world. At the UN the hypocritical imperialist powers, backed by Russia and People’s China, condemned the test and the Americans are pushing for harsh economic sanctions against the DPR Korea. At an emergency Security Council session on Monday, the United States called for mandatory sanctions including inspections of all cargo in and out of north Korea, financial curbs and restrictions on goods that could have military uses. If passed it could pave the way for imperialist Iraq-style military action against the DPRK. The five UN veto powers – Britain, America, Russia, China and France are meeting in secret session to consider the American demand. Russia and China are opposing moves that would sanction an imperialist naval blockade of north Korea though Japan has already moved to ban all Democratic Korean imports and bar all DPRK ships from entering Japanese waters. But Iran, also under threat of US attack over the nuclear issue, has pointed out that the north Korean nuclear test had its roots in the behaviour of the United States and other powers which possess nuclear arsenals, dominate the UN Security Council and use the Council to achieve their goals and interests. The world will only enjoy true peace and security when the big powers, the US in particular, are disarmed. Therefore, worldwide nuclear disarmament is the solution to the establishment of global peace and security and this must first start with those world powers who own such weapons, Gholam Hosein Elham said in his weekly press briefing in Tehran on Tuesday. The Iranian official called on all nuclear powers to disarm and urged the International Atomic Energy Agency (IAEA) to refrain from practicing injustice and discrimination when dealing with international issues, adding that nuclear disarmament in the Middle East should start with the Zionist regime. Wild talk from the American corner about naval blockades and pre-emptive strikes have been dismissed by the Russians, Chinese and south Koreans. China has stressed that war over the DPRK’s nuclear programme was “unimaginable” but it has “strongly urged” the DPRK to honour its commitment to de-nuclearisation, stop all moves that may further worsen the situation and return to the Six-Party Talks aimed at making the Korean Peninsula free from nuclear weapons. These have been stalled for over a year due to American intransigence and north Korea will only return to the talks if the United States makes concessions. “We are still willing to abandon nuclear programmes and return to six-party talks” a north Korean official was reported as saying in Beijing. “We can do that any time only if the United States takes corresponding measures,” the unidentified official said, adding that if the Americans did not respond the DPRK would have no choice but to conduct further tests and arm its missiles. This was noted in a congratulatory message sent by the NCP to DPRK leader, Comrade Kim Jong Il, on Monday. Congratulating the Workers’ Party of Korea, the Government and people of the DPRK for their efforts that have led to the successful test of a nuclear device on 9th October the message said: “US imperialism has reneged on past agreements with the DPRK, continued its diplomatic and economic blockade and persisted in rejecting the reasonable and realistic position of the DPRK at the past six- power talks in Beijing. The nuclear test was therefore an inevitable and justifiable response in the face of the intransigence of US imperialism. We are convinced that the development of the DPRK’s nuclear deterrent will not only deter US imperialism from contemplating any future aggression against the DPRK but also contribute to peace and stability on the Korean peninsula”. IN 1950 US statesman John Foster Dulles visited US troops in the south of Korea to approve of plans to invade the fledgling Democratic People’s Republic of Korea. He boasted this would take only one day, after which the US would be poised to attack the equally young People’s Republic of China. He and the US military top brass talked of breakfast in Kaesong and supper at the Chinese border. Korea had been left divided after the Second World War and the defeat of Japanese imperialism which had occupied the peninsula since 1910. 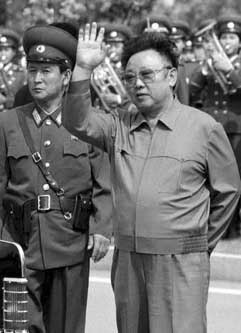 The north had been liberated by the Korean people, led by Comrade Kim Il Sung and supported by the Soviet Red Army, while US forces occupied the south. This was meant to be a temporary arrangement. The Americans attacked the DPRK but failed to defeat it. The invasion that was supposed to be over in a day lasted for three years before the US forces were fought to a standstill. What the Koreans lacked in weapons and technology they made up for in sheer courage and commitment to defend their homeland. The war ended in 1953 with an armistice, not a peace treaty, signed between the DPRK and the United States. This has left the country divided by the continuing American occupation. The terms of the armistice were that there should be a peace conference established within three months to negotiate the terms of a peaceful reunification for Korea. The Americans reneged on this commitment and instead built a huge wall across Korea. Since then the people of southern Korea have had to put up with US military occupation and puppet governments hostile to the DPRK, while the people of the DPRK have had to live under the constant threat of attack, under anti-communist hostility and under trade and economic embargoes. The people of the DPRK never asked to be isolated – the Americans forced it upon them. Not surprisingly they have always paid great attention to their defences. The Clinton government in Washington brought a little thawing in the hostility. Fears that the DPRK would develop its own nuclear weapons prompted a pledge by the American to provide nuclear power generators in return for the DPRK dropping its nuclear programme. But that agreement was torn up by George W Bush, who declared that the DPRK was one of four countries – along with Iraq, Iran and Syria – he dubbed the “axis of evil”, making threats of attack on all of them. The Saddam Hussein government in Iraq complied with US and United Nations demands to get rid of all “weapons of mass destruction” (WMDs), hoping this would avert an invasion. It did the opposite. Once Iraq had effectively disarmed itself the US, backed by Britain, invaded, claiming that Iraq still had WMDs in spite of UN inspectors’ reports to the contrary. The lesson is clear: disarm and face invasion. The DPRK, Iran and Syria have noted it well. Now the DPRK has proudly produced its own nuclear weapons programme. This has been roundly condemned in all the western imperialist media and by Tony Blair – who just a few weeks ago decided to renew Britain’s Trident nuclear weapons system without any parliamentary debate. Many on the Left who should know better have also taken up the imperialists’ cries of horror and outrage. But in the Third World and other countries threatened by imperialism, there is joy and solidarity that the tiny DPRK is standing firm against US bullying and defying the warmongers. The people of the DPRK are peaceful people. They have no imperialist traditions or ambitions. They do not seek to impose anything on anyone. They just want to secure the socialist society that they are building against invasion and destruction. They are entitled to our support and solidarity. The imperialists are rattling their sabres but they are now a lot less likely to actually attack the DPRK than they were a week ago.